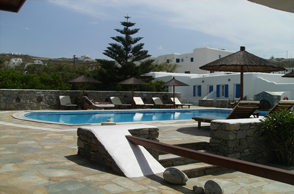 Anemos Studios & Apartments complex is situated in the scenic settlement of Ornos, on the southern tip of Mykonos Island, Greece. 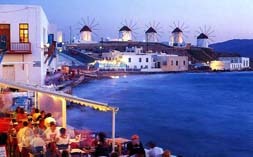 The distance of Mykonos Town is only 2,5 km. 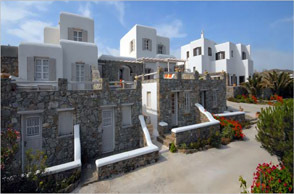 It consists of 33 studios and apartments, all of which are designed according to the Cycladic architectural style, in shades of bright white and blue, with curves and arches. Ftelia Bay Boutique Hotel complex is nestled in the north of Mykonos, right in the inner end of a wonderful bay, a spot of spectacular natural beauty. This charming boutique hotel in Mykonos, just a stone’s throw from Ftelia Beach, has been fully refurbished to provide modern aesthetics enhanced with traditional elements, giving a truly unique dimension to your stay and making vacations with friends and your dearest ones a very special experience. 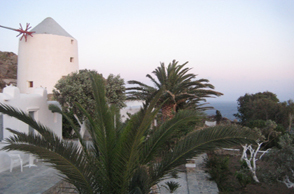 The traditional and hospitality complex Apostolis Windmill Studios and Apartments is situated 3km from Mykonos town and few minutes walk from the very famous beaches Plati-Yialos and Psarou. There are available studios and apartments which are fully equipped. Each of our rooms contains kitchenette, TV, a/c, veranda and parking.